Once you get past the onerous installation requirements, Commerce Server 2000 can help make you a player in the e-business game. Is your company looking to build an online business? Do you need an e-commerce site to take orders for your product? Do you want to start your own online auction? If you answered yes to any of those questions, then Commerce Server 2000 may be for you. 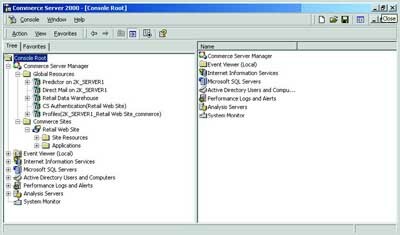 Commerce Server 2000 integrates well with the other .NET Server products, especially BizTalk Server and SQL Server. 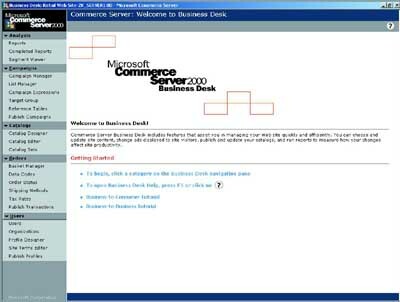 Commerce Server 2000 can be used to build B2C (Business-to-Consumer) and B2B (Business-to-Business) e-commerce sites. 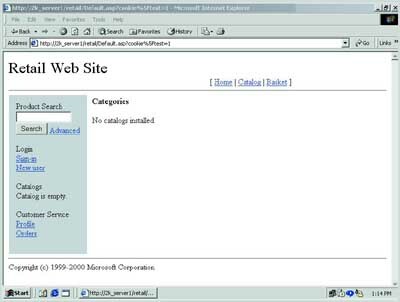 Microsoft provides “canned” starter sites that can be customized and deployed quickly to get your site up and running. I’ve found these canned sites to be very good starting points. Commerce Server also has a software-development kit for more advanced designing. You can use Commerce Server to manage your advertising and handle marketing campaigns, as well as provide data analysis and customer-relationship management. Commerce Server 2000 uses familiar technologies like XML for most of its internal code, and it relies heavily on Active Server Pages for its sites. SQL Server is used as its data warehouse. You should also install XML Parser (MSXML) 3.0, Service Pack 1. I recommend downloading the Commerce Server 2000 installation guide from Microsoft at (www.microsoft.com/commerceserver/downloads/solutionsites.asp). I printed it out and followed it to the letter when installing and didn’t run into any problems. Be warned, though, the setup guide is 27 pages long. I’ve never used a product with so many prerequisites. When installing SQL, you must enable Full-Text Searching and mixed-mode authentication. You must also install Analysis Services to enable Commerce Server Analysis when using SQL 2000. Commerce Server 2000 can use Active Directory for authentication, but it shouldn’t be installed on a domain controller. I found meeting all of the prerequisites the hardest part of installing Commerce Server. This is where the installation guide was a lifesaver. The actual install was pretty easy, much like running through the typical setup of any Microsoft Product. Everything installed and ran fine. However, I don’t have any Web traffic hitting my server. I would beef up my server substantially from Microsoft’s minimum hardware requirements if I were building a production box. Also, I wouldn’t load all of the components on the same box. Rather, I would spread the load across several machines, with each machine having at least a gigahertz processor and as much RAM and disk space as possible. All administration can be done from your desktop, via the MMC, as shown in Figure 1. Sites. A Commerce Server 2000 site is a collection of Active Server Page (ASP)-based applications and Web pages. Applications. ASP pages are grouped together into Applications. This allows management of all pages collectively. Applications are accessed via a Web address. A typical site will have two applications: one used by customers to order the product and the other used by administrators to manage data. Resources. Resources are Component Object Model (COM) objects used by the Web pages of an application and provide functionality to applications. Commerce Server 2000 has two types of resources: Global and Site. Global resources are available by all Web sites hosted by Commerce Server 2000. Site resources are available only for a specific site. How Do I Build My First Site? The answer to this question is easier than you think. Commerce Server comes with a tool called the Site Packager. This is one of the easiest tools I’ve ever used. It packages a Commerce Server Web site into a single file, containing a .pup file extension that can move an entire site from one server to another. Site Packager can also unpack sites. Retail Solution Site, which provides business-to-consumer services. This site allows anonymous access for browsing. Logging in is only required when making a purchase, and users create their own user account for purchasing. The default payment type is credit cards. Supplier Solution Site, which provides business-to-business services. This site requires IIS authentication and allows both credit card and purchase order payments. Self-registration isn’t allowed, and all user accounts must be created beforehand. Building your first site is as simple as downloading the above Solution Sites and using the Site Packager to unpack the site you want to use (retail or supplier). This is so easy it made me wish I had a product to sell! 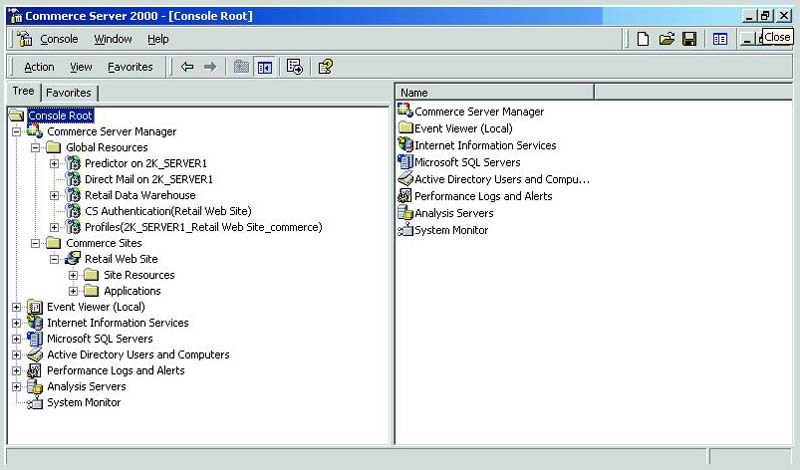 To unpack a site, open the Commerce Server Manager as shown in Figure 1. Right-click Commerce Sites and choose New | Unpack Site. Enter the location of the Solution Site File. You’ll be provided a wizard to guide you through unpacking the site. After walking through the wizard, you can view your new site by typing in http://servername/sitename. The default retail site is shown in Figure 2. The goal of an e-commerce site is to sell a product. In order to customize the products that appear on your site, use the Business Desk administrative tool. Business Desk is installed by typing http://server/sitenamebizdesk. Business Desk doesn’t have to run on the Commerce Server; it can be run on any computer running Windows 98 or higher. However, the computer running Business Desk must have Internet Explorer 5.5 or higher. Business Desk is shown in Figure 3. I ran it successfully on both a Win2K Professional machine and a Windows 98 machine. Property Definitions. These define the available fields for a product or category. Name, Description, Author, Color and Weight are examples of property definitions. Product Definitions. These define which of the available fields will be used for the specified product. Product definitions are groupings of Property Definitions. As an example, let’s say you’re selling books. You may create a Product Definition that contains the Property Definitions Name, Author and ISBN. Category Definitions. These define the available properties for a category. Like Product Definitions, these group Property Definitions together. Create the needed Property Definitions. Group the Property Definitions into Product and Category Definitions. Add Categories to the Catalog. Commerce Server 2000 is definitely a key player in Microsoft’s .NET initiative. It works well with the other .NET servers, especially BizTalk server and Content Management Server. Microsoft has done a good job of making it possible to run a completely Microsoft e-commerce shop. The company has a new partner certification, Commerce Server 2000 Independent Software Vendor (ISV) Partner Program, which will enable customers to verify that they’re purchasing third-party products that have been tested and approved by Microsoft. This should add to the functionality and stability of Commerce Server 2000. In my lab I have Commerce Server running on four separate machines, each with different hardware levels. I found it to be very stable on all of my machines, with no troubleshooting required yet. Obviously, this might change if I had thousands of users hitting my site at the same time. Commerce Server 2000’s scalability makes it easy to add servers as your e-commerce needs grow. You can have one server running Commerce Server and all supporting applications, such as SQL and the Business Desk application, or you can put each application on its own dedicated server. Multiple Web servers can then be grouped into a farm in which all the computers work together to process a user’s request. You can then use Application Center (see related story in this section) to replicate the site content throughout the farm. This gives the flexibility required to make Commerce Server 2000 a potential solution for both small and large shops. 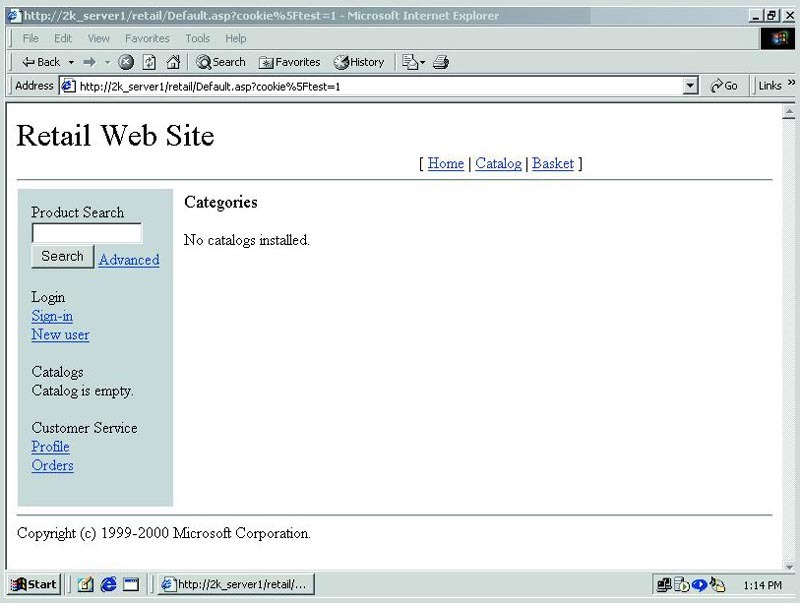 I really like Commerce Server 2000’s Site Packager tool, which makes it very easy to move a site from development (or staging) to production. I also like its analysis and reporting capabilities. I found it easy find the information that I needed. 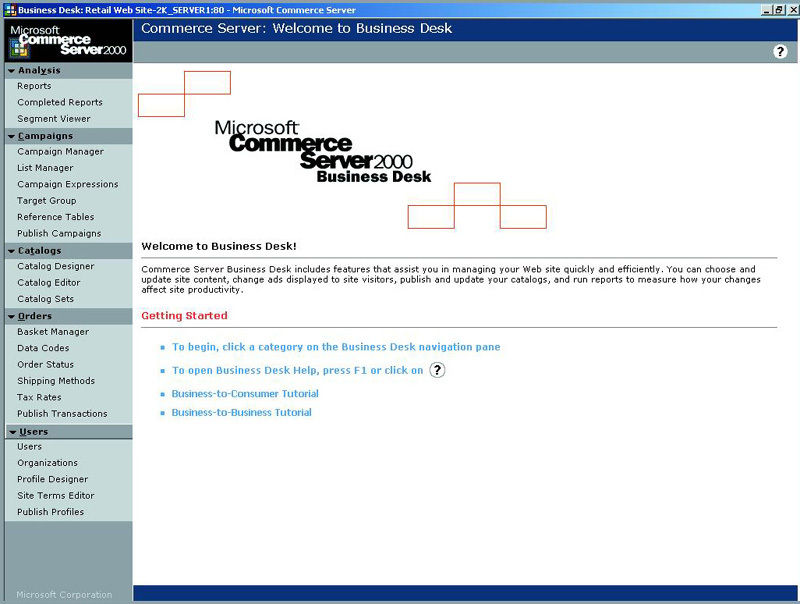 I was very impressed with Commerce Server 2000. It was easy to set up and use for basic e-commerce Web site design, especially its catalog features. Within a few hours you should have the hang of adding and removing categories and products, and catalog management is very easy. With practice and some development skills, you could build a very sophisticated site. Any company that wants an e-commerce presence can benefit from Commerce Server 2000. It could benefit small and large companies alike; but at $8,500 per processor, it may not fit well into many small companies’ budgets. Commerce Server 2000 provides a scalable, easy-to-maintain e-commerce solution at a fair price.